The royal castle of Neuschwanstein was for King Ludwig II already as a child an important station. During his childhood he often came here because his father was the owner of the castle of Hohenschwangau. The medieval castle of Vorder- and Hinterschwanstein dates already back to the 11th century. 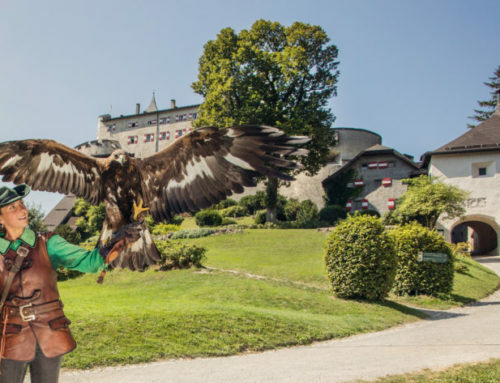 Since the 15th century the castle of Hohenschwangau became more and more important. The old castles were only ruins. King Ludwig II went often to this castle to enjoy th view and to play there. Many hikers used the ruins as a destination and visitor’s platform over the area. After becoming the king of Bavaria, King Ludwig II decided to reconstruct what was left of the ruins and to make it to a medieval castle and into the ideal of a Knight’s castle. 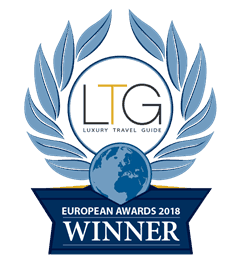 Together with the Linderhof palace in the style of rococo and the palace of Herrenchiemsee in the baroque style, it is reflects the Bavarian historism. After a visit to the Warburg in Germany and the visit of palace of Pierrefonds in France. The castle of Warburg became also the main architectural example to construct the castle of Neuschwanstein. In the year 1869 the start of the construction of Neuschwanstein started. The original plan was changed several times and not everything was realized since King Ludwig wanted to change always the plans. The idea was it for King Ludwig that it should be a livable theater ambiente. It was done as a temple to Richard Wagner, even if Wagner never visited the castle. Even if the size is enormous it would have never been enough for a King’s palace. It has only place for the King’s apartments and for the servants. So the main use was only as living and decorative purposes. Even if the costs were more than doubled until the death of King Ludwig, he finances most of the castles by his own money and credits which he took from different banks (also the state bank of Bavaria). Already 1885 the first execution was threatening King Ludwig. With another credit he avoided that. In the year 1872 King Ludwig lived for 172 days the castle of Neuschwanstein until he was sent to the castle Berg where he dies 1 day later, after he received the order to not be king of Bavaria any more. Some people say that his spirit still lives in the castle even if King Ludwig was very shy and did not want anybody seeing the interior. 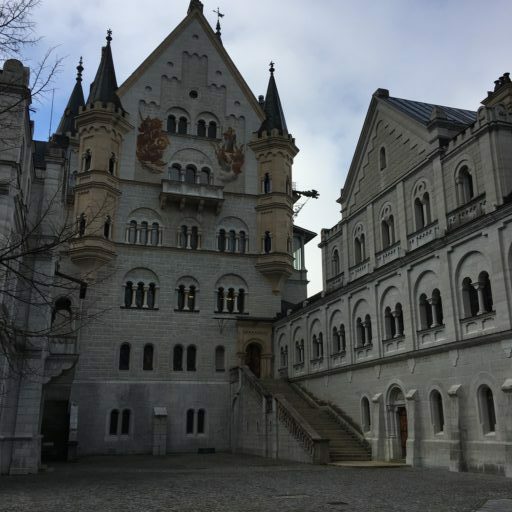 The palace of Neuschwanstein was opened already 6 weeks after his death to the public in order to refinance and pay-off his credits. It took the state until 1899 to pay off the credits that King Ludwig II took at different banks to be paid back. with his construction to give jobs to people there and also nowadays as a tourist attraction but on the other hand also brought the state very close to bankruptcy. Nowadays more than 1,5 Mio. tourist visit the castle each year. 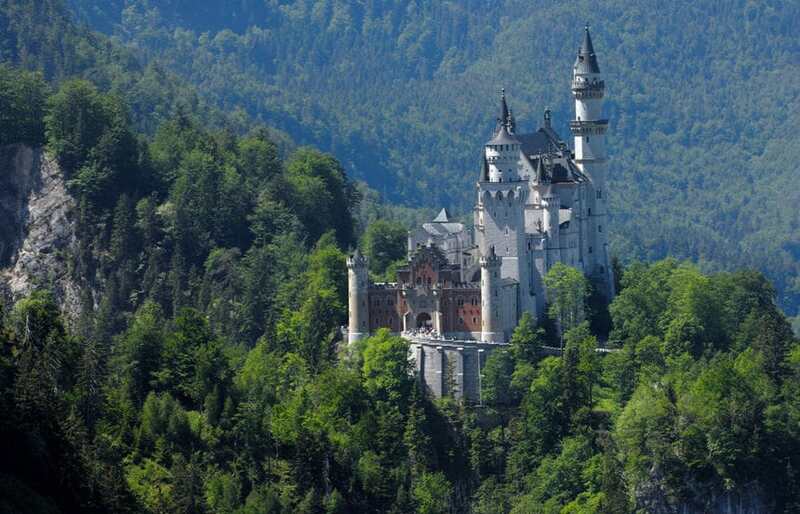 It became also the most famous castle in Germany due to the movies and due to Disney: The castle in Anaheim and Disneyland Paris have a certain similarity to the castle of Neuschwanstein. All over the world it is mostly known as the cindarella castle of the Disney. Also the Hotel Excalibur Hotel & Casino in Las Vegas has a small similarity. In some movies about this Bavarian King and some other movies it functioned in the background. Newly also on stamps and on some German 2€ coins the castle of Neuschwanstein can be found. So it became a very big industry for the region and the villages nearby. The royal King ludwig’s castle of Neuschwanstein nearby Füssen and opposite site of the castle of Hohenschwangau (his parent’s castle) shows in the most eccentric and best way of King Ludwig’s fantasy and reflects best his idea of a medieval castle but still not forgetting about the standard of the 19th century. In his last wish King Ludwig wanted that each palace and castle should be destroyed after his death. 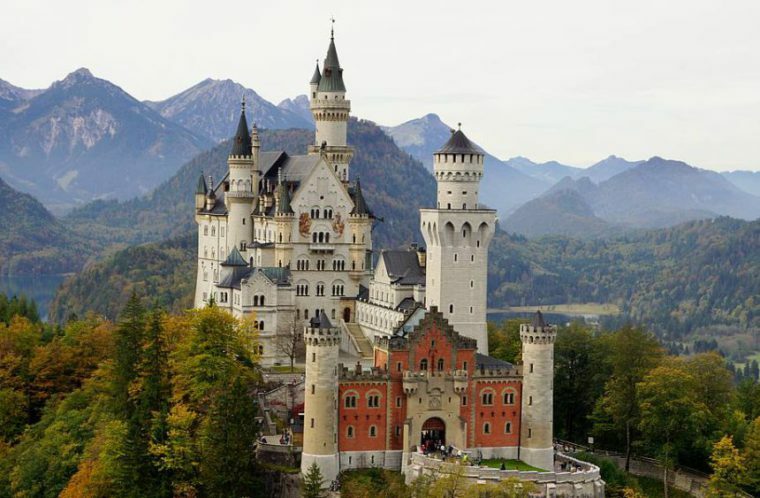 Luckily the Bavarian state decided differently and gives us now days the possibility to visit all of his dream castles and brings us closer to his ideas and lifestyle. The palace of Neuschwanstein is the most visited castle in Germany with over 1,5 Mio. visitors over year. So please book ahead before waiting in a very long line. 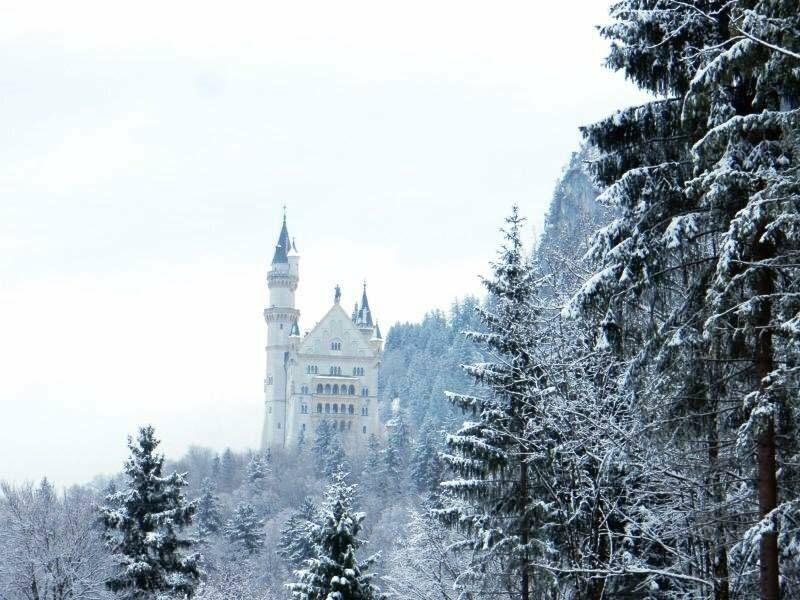 Enjoy the castle of Neuschwanstein the whole year around and see the spectacular landscape around the palace. 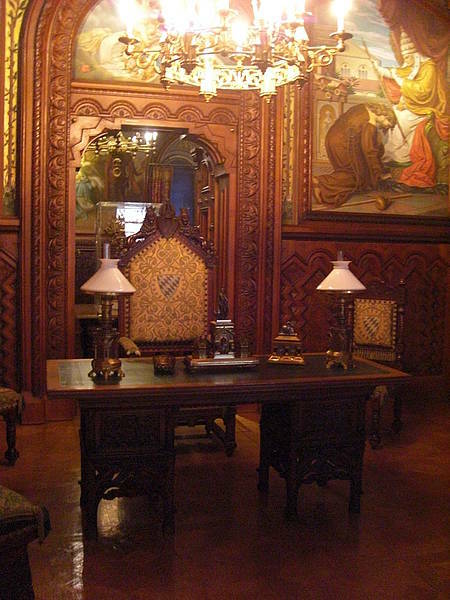 See, feel and enter the dreamworld of this eccentric king and learn why he chose place and what it brought to the area. Enjoy also the ride to the nearby church of Wies, Oberammergau, etc. it is a fascinating and great opportunity and see all the prejudices of Bavarian landscape there.